As of this week, there is another out of town visitor to add to the list - Curlew Sandpiper. 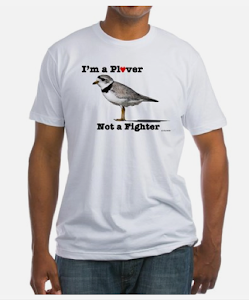 The sandpiper was found at the East Pond of Jamaica Bay Wildlife Refuge. Some species have already begun their southbound migration and rangers have lowered the water level on the East Pond to create mud-flats for the hungry, long distance travelers. The pond is a magnet for plovers, sandpipers, yellowlegs, dowitchers, godwits and many other species known collectively as shorebirds. A majority of these birds breed in the far north or tundra. 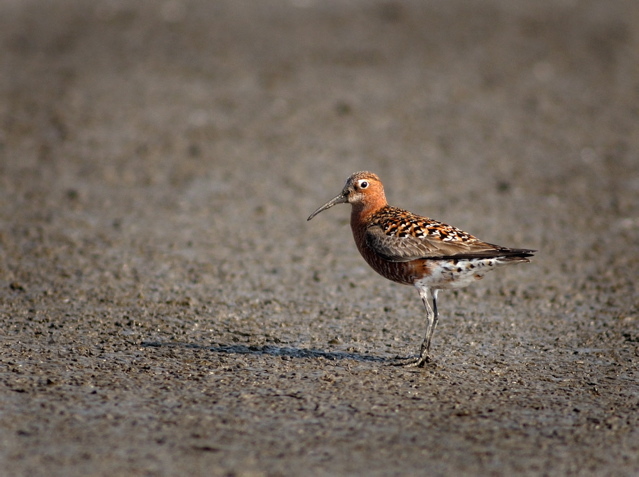 The Curlew Sandpiper typically breeds in northern Siberia. One theory as to how the rare vagrants end up on the east coast of the United States is that they take a shortcut over the top, so to speak. A pair of Curlew Sandpipers showed up at Cape May earlier in the year and Sean drove down to photograph them. Even so, he still wanted to check out the one at Jamaica Bay and asked me to join him. His brother, David, would meet us at the parking lot. 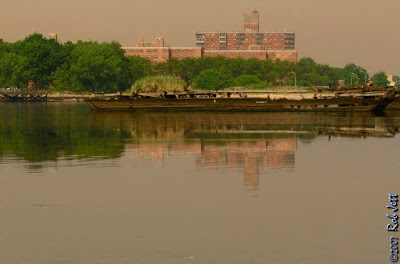 He also wanted to look for the Western Reef Heron at Coney Island Creek to take some more photos. The heron is still around but occasionally disappears for stretches of time. 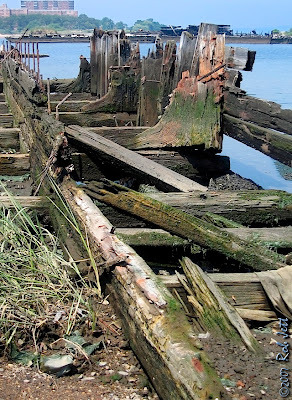 In the shallow water just offshore, there are the rotting, wooden skeletons of several old barges. 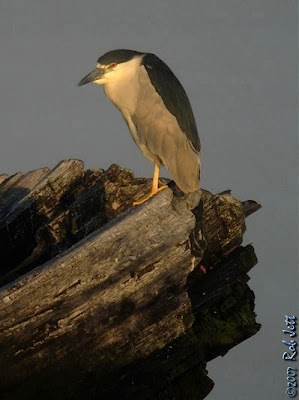 Black-crowned Night-Herons like to roost on the vertical ribs and we speculated that, when the reef heron cannot be located, he is possibly hidden from view within the recesses of the old wrecks. The sun had been up for about an hour when we arrived at the creek. Sean parked behind the Home Depot, which brought us farther east into the creek than during our last visit. It is beyond a bend in the creek from where the bird spends most of his time. 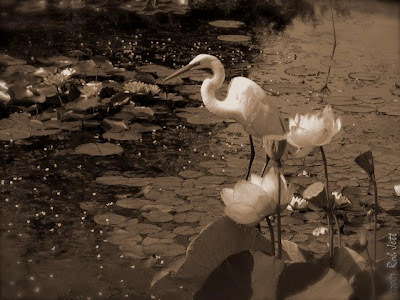 Doug once found the reef heron behind Home Depot when others were unable to locate him. From that point, we walked down the shore towards the narrow channel on the east side of Calvert Vaux Park (the park previously known as Dreier-Offerman Park). At low tide, an exposed mud-flat in the channel attracts several species of wading birds and shorebirds, not just the Western Reef Heron. The heron was not present and Sean did not want to spend a lot of time looking as his primary objective was to meet up with David and find the Curlew Sandpiper. I did not mind because having begun my day in the calm stillness along the creek was a fair consolation. Etched in my brain is the impression of rosy, early morning sun illuminating decaying, hulking masses of weather-sculpted timber. Hunched over and sleepy, red-eyed night-herons were resting on wood monoliths, looking as though they had just returned home after an evening of drunken debauchery. Finding and grasping a fleeting moment of repose in the dissonance of city life is golden. The Curlew Sandpiper was reportedly feeding with some dowitchers near the north end of the East Pond. Access to the north end is via a vehicle restricted gravel road, which leads to a narrow swath cut though a seemingly impenetrable jungle of phragmites. Rubber "Wellies" are essential footwear as the trail leads out onto a mud-flat where, if you are not observant, a wrong step could put you into thigh-deep muck. We walked south, towards the sandpiper's last known whereabouts, hugging the edge of the phragmites. A few feet to our left were scattered patches of hidden mud traps. Least Sandpipers and Semipalmated Plover probed the pungent, insect-rich mud close to the wall of reeds. Small groups of Short-billed Dowitchers fed in shallow water. Interspersed throughout the pond’s receding water were Greater Yellowlegs, Lesser Yellowlegs, Stilt Sandpiper, Pectoral Sandpiper and Semipalmated Sandpiper. A single American Oystercatcher broadcast his presence with emphatic, whistled “wheeps”. We set up our tripods near a midpoint on the west side of the pond. Earlier we had seen a raccoon at the edge of the water in that spot. From there we had a clear view of both sides, from “The Raunt” to our right and Sanderling Point and North Island to our left. For two and a half hours, we scanned from north to south and combed through ever bird in sight. 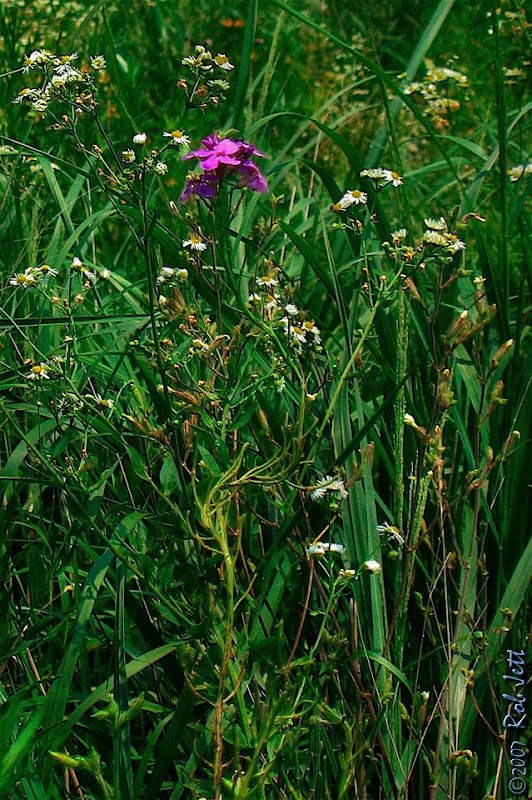 Patches of pink Swamp-rose Mallow on the far shore added a nice visual break to the monotony of a wall of green phragmites. An “A” train was parked on the tracks that are parallel to the pond and on the opposite side of the phragmites. Periodically, the hydraulic breaks would release pressure, emitting a loud, hissing pop that triggered flocks of shorebirds into a flying frenzy. We would use the opportunity to scan for the Curlew Sandpiper in the flocks that passed in front of us. Never having seen one, I repeatedly asked Sean if it was possible for me to overlook. Finally, he replied, “Just look for a flying brick”. 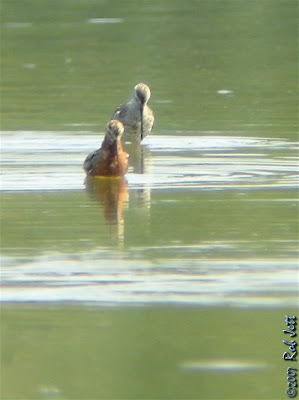 Last year we watched helplessly as a photographer attempted to cross from east to west at the northern end of the pond. 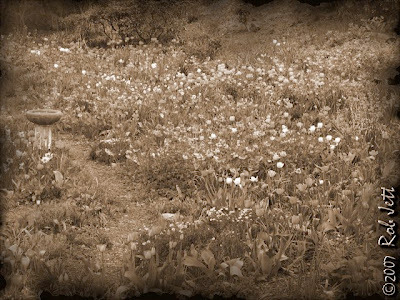 He ended up waist-deep in the mud and unable to free himself. Eventually, Ed Coyle and another birder carried some large pieces of driftwood down the east trail, built a boardwalk and pulled him from the muck. There is a warning sign at that spot, so he should not have even attempted the crossing. I didn’t see any warning signs in the middle of the pond so I decided to try and walk directly across to the east side. Sean and David looked at me as if I was crazy. 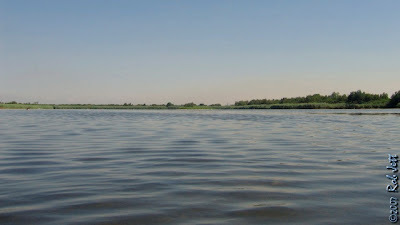 I picked my steps carefully, made it to the center of the pond, and stopped on a sandbar. The water was never more that about six inches deep. From there, I enjoyed the shorebird’s perspective of the pond and watched a flock of Barn Swallows swooping all around me. 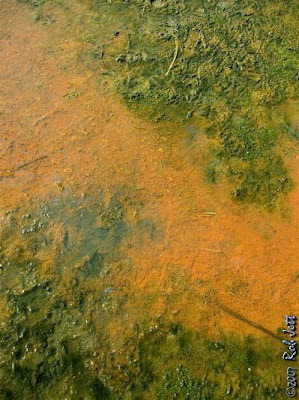 Ahead of me, a thick matt of algae covered the water and, in open areas, the water appeared dark and deep. I turned around and went back the way I came. Sean had walked back towards Sanderling Point and was sitting on the ground with his camera. David suddenly picked up his scope and hurried in the direction of his brother. My cellphone rang just as I stepped back on to the shore and started in their direction. It was Sean, and in a hushed voice, said two words, “Found it.” He was not exaggerating when he explained that I could not miss the bird. The sandpiper’s plumage had begun the transition to dull winter colors, but was still mostly a deep, chestnut-red. In addition to his striking color, black legs and a long, thin decurved bill created a unique profile among our expected shorebirds. Our vigilance had paid off, but I could not figure out how we overlooked him. Sean said that he was photographing a Stilt Sandpiper when the curlew just appeared in his frame. It is possible that he was always present, but just blocked from view by the larger, rounder dowitchers. For thirty minutes, we watched him walk back and forth in a small area several yards offshore, picking insects from the water. By 11AM, we decided to pack up our gear and get an early lunch. On our way back to the trail, David pointed out an insect on the ground and asked if it was a Mayfly. As we looked, Sean pointed out another one. A quick scan revealed that they were all over the place. I sat down in the mud for a close look and was surprised to see that they were tiny dragonflies. 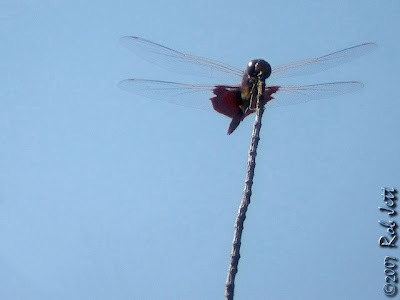 We were probably in the midst of a mass emergence of the unidentified dragonflies. 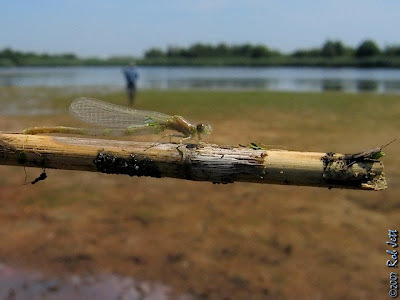 The event was good for the shorebirds, bad for the slow dragonflies. I used to say (partly in jest) that there was always “one more bird” before going home. Each day it seems like I learn a little more about my surroundings, maybe I should change the word “bird” to “species” or “thing”. 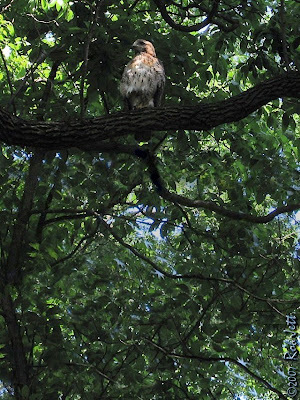 On July 7th, there was a short posting and photograph on the "Gothamist" entitled "Fine Feathered Visitor". 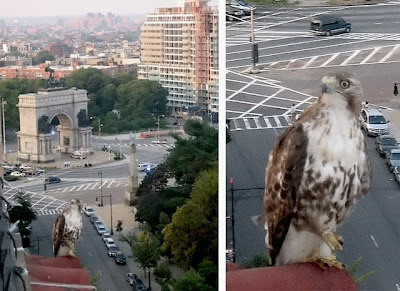 From his apartment on Prospect Park West, Spencer photographed one of the pair of young Red-tailed Hawks that I've written about who frequent the north end of the park. 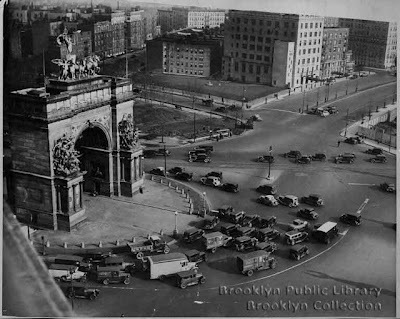 The background of the image is a great perspective of Grand Army Plaza. During a search on an unrelated subject I came across a photograph of nearly the same point of view. Actually, it is likely from the same building as their are only three tall buildings on Prospect Park West near Grand Army Plaza. Only one is that close to the plaza. 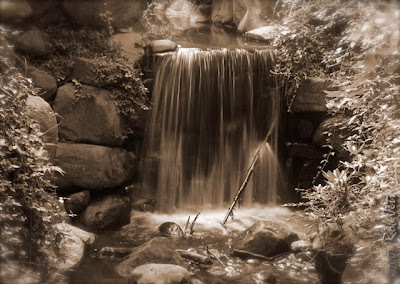 The photo was taken in 1934. Robin and I took a walk to the Brooklyn Botanic Garden in the late-morning. It takes us about 15 minutes if we cut through the Midwood...that is, if I do not find something unusual along the way to slow us down. I have not seen any postings about the Acadian Flycatchers, so I also wanted to look around for them. It would be a treat to see a whole brood of little, squeaky flycatchers. Small flocks of Barn Swallows have converged on Prospect Park's lakes and meadows. As we walked across the Long Meadow from the Picnic House towards the Ravine, about a dozen swallows zoomed back and forth over the footpath. The freshly mowed expanse of grass stirred millions of tiny insects and the iridescent, blue birds coursing low over the grass quickly snapped them up. In the Ravine, we spotted several very young robins and cardinals. It seemed unusually late in the season to see fledglings. We briefly listened for the Acadian Flycatchers near the nest, but it was very quiet in the woods; even the young Red-tailed Hawks were mute. The botanic garden was noisy compared to Prospect Park. As we entered near Empire Boulevard a mockingbird greeted us with an unending string of robin, Blue Jay, cardinal and oriole vocalizations. 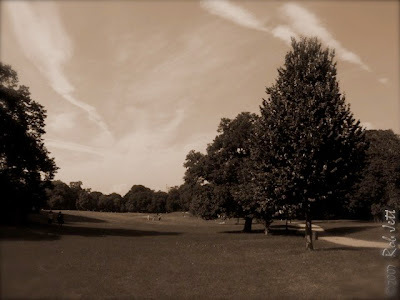 Unlike Prospect Park, open, grassy areas dominate the garden’s landscape. Northern Mockingbirds prefer open areas and several pairs nest in the relatively limited space. Conversely, they rarely nest across Flatbush Avenue in Prospect Park. 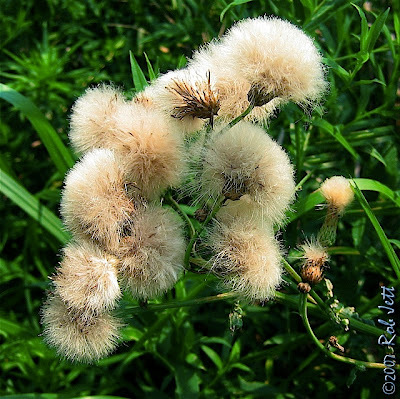 In addition to looking at flowers, I was hoping to find some interesting butterflies or dragonflies. During the mid-summer, there is always a stunning array of mixed perennials around the edges of the Lily Pond Terrace. 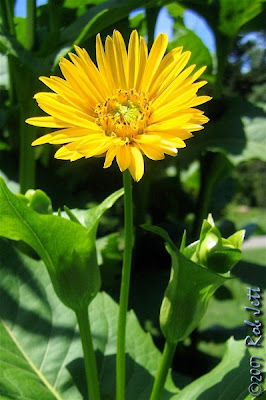 If you have limited time, it is a good garden starting point. 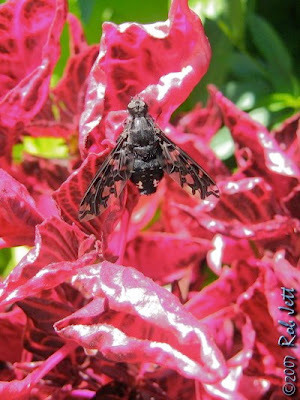 Robin pointed out a beautiful bee with lightening bolt-like patterned wings. I was sure that he was not a real bee, but an imposter. As he patrolled a small cluster of day-glow pink, beet plants, I followed closely, camera at the ready. When returning home through the Midwood, I decided to scour the woodlands near the main waterways for signs of the Acadian Flycatchers. 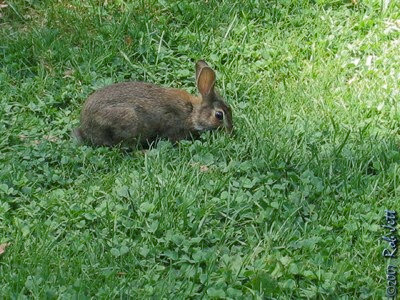 At a small, grassy patch at the north entrance to the Midwood, I spotted a young cottontail nibbling on blades of grass. I told him that it wasn't a good idea to be eating out in the open, with his back to the trees. 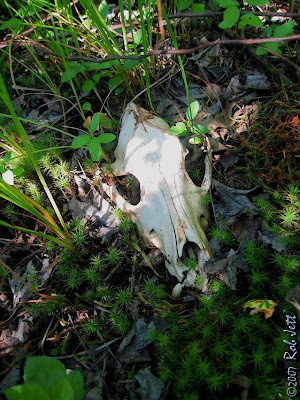 He was about a foot from a fence and the protection of thick underbrush. He ignored my warning about the Red-tailed Hawks, so I prodded him into the cover of a dense growth of goutweed. 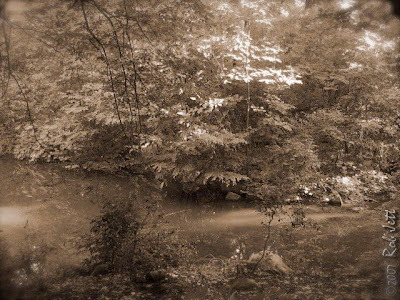 The Ravine's wet, deciduous forest seemed like it would be the most desirable habitat. Two paths loop around the area. For an hour, I slowly examined every stretch of trees and stream. I primarily just listened for the sounds of young birds. There were some very young, "crestless" cardinals begging for food in thickets near the ground. I followed the non-stop pleas of a speckled, fledgling robin to a perch in an oak tree. Near the Lower Pool, there were three fledgling kingbirds, side by side in a weeping willow, simultaneously squawking. I never located the Acadian Flycatchers. I am not aware of any reference material to learn baby animal vocalizations. In addition, I cannot describe the difference between various baby animals’ cries, but much of the time I can just tell. I started to wonder what is it about the frequency and/or quality of a baby in distress, any baby species, which stimulates a reaction in adults? Who among us has not had an immediate, instinctive response from the sound of an orphaned or abandoned kitten? How many children have heard the cries of then brought home, an injured baby bird? I have read several accounts of dogs or cats adopting an orphan of a different species. How did they know that the small creature's noises meant, "take care of me"? I do not have any answers to these questions. Maybe it is just better to believe that inside of nearly all of us is the drive to survive and to help others do the same. 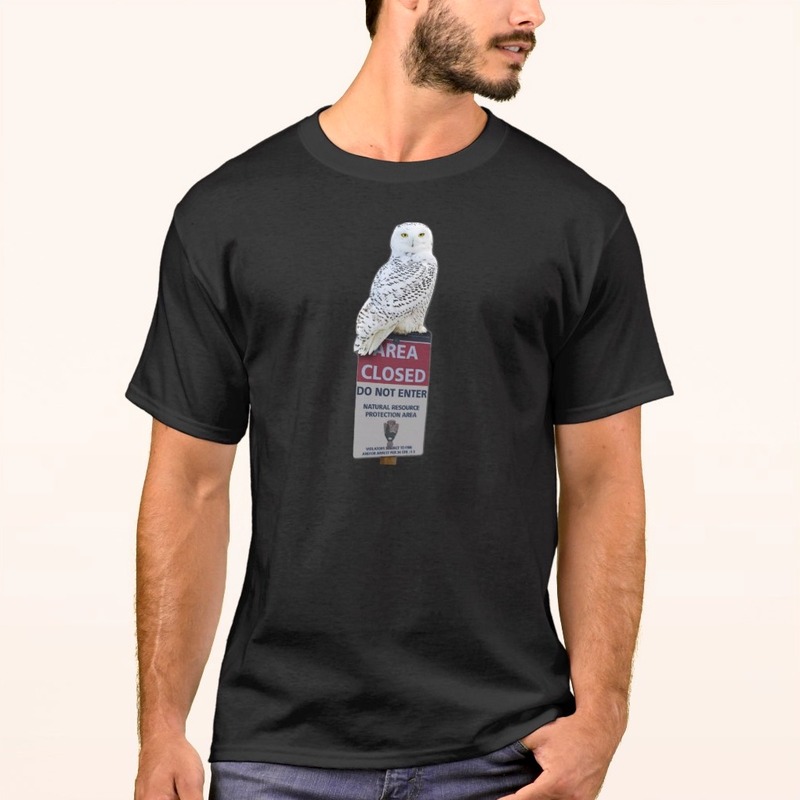 A kestrel tried to land on the television antenna bolted to the roof of our neighbor's building, startling both my wife and I. He had not expected to see the two of us watching the sunset a few yards away. Like a mouse's skill at squeezing under a closed door, he instinctually careened through narrow canyons formed by rows of closely spaced stone buildings. We should have seen him coming, but the small, agile falcon seemed to have just appeared out of thin air. Virtually unseen (especially by the sparrows that he regularly hunted), his precision flying traced the profile of the building until he burst out into the open for a quick reconnaissance. It took an instant for him to realize he was not alone on the roof and abruptly change course. In the blink of an eye he passed over us, over the crest of a mature maple tree that casts a shadow down on our roof, across 5th Street, then, as quickly as he appeared, descended out of sight between the next row of brownstones. How the Park Looks to Outsiders. A few moments on the ferry and the street cars and Prospect Park is reached, with its breathings of pure air and glimpses of pastoral beauty. Wandering in the shady paths, one sees little to remind him of an immense outlay of money. dashing among the rocks and boulders, over which hang the leaves of trailing vines, and at length finds rest in the bosom of a lake. From the little porch at the west end of the house the visitor enters a long, spacious room, in which is a huge old-fashioned fireplace. The mantel is ornamented by large China vases, containing flowers. But for the counter, chairs, and tables, one could imagine it really a stately New England dining-room of the last century. From the large bay window at the south end is a fine view, through the gap of the Ravine, extending beyond the Narrows. 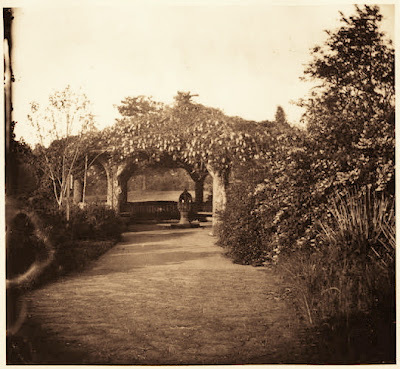 is the Eastwood arch, the gables of which are richly mantled by vines. From here the walk back to the entrance Is very pleasant. A deep clump of woods is threaded by dark foot-paths, which at last lead out into the open green. All day these groves are musical with the notes of the shy wood warblers. 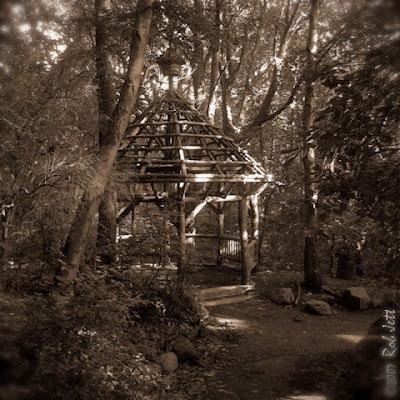 Orioles, blue birds, robins and sparrows sing through the hours of morning and noon, and in the late afternoon the wood-thrush is heard, piping tender and plaintive symphonies which echo In the shadowy leaf-arched alcoves. A homeward walk, until one reaches the exit, can easily be dreamed away. The newer part of the Park at the northwest corner is rapidly improving. The grand drive on the west side has been completed, making the whole circuit now in use a distance of five miles. Near the temporary bridge, which crosses an arm of the lake at the foot of Breeze Hill, is the projected site of the terrace, near which will will be the refectory, sort of hotel for refreshments, but of a more public character than the Farm House. On the east side of the Park an excavation of blue clay is making for paving the bottoms of the lakes. The preceding text was a column in The Brooklyn Daily Eagle on July, 21, 1871. Note that the Brooklyn Bridge wouldn't open for another 12 years and that Prospect Park had only been open to the public for three years. Saturday was our final day of the 2007 breeding bird survey at the reservoir. I wondered aloud if there would be something for us to come back to next year. Our volunteer list for the day was John Criscitiello, Rusty Harold, Steve Nanz, Suzanne Ortiz, Janet Schumacher, Heidi Steiner and myself. We could not have asked for better weather. It was mild, dry and a slight breeze was blowing in from the west. After we slathered on sunblock and bug spray in the parking lot, we started the day as we had each of the previous 6 surveys; dodging cars to cross the busy roadway then walking up a short, dirt rise to the running and biking trail that rings the basins. Despite the reservoir's relative isolation, we always encountered many people running, walking or cycling the 1 mile loop. A narrow border of trees across from the parking lot, has held several auspicious "good-way-to-start-the-day" birds. Among the species on the list are Yellow-billed Cuckoo, Wood Thrush and Great Crested Flycatcher. We've also seen Indigo Bunting along that stretch. On our last morning of the survey, Steve spotted a single, hyperactive Blue-gray Gnatcatcher foraging near the treetops. It is difficult for me to grasp the minuteness of an animal that can subsist on a days worth of gnats. As we turned the corner of basin #1, I spotted a male goldfinch still sporting his brilliant yellow breeding plumage. He flew from inside the reservoir and into a cherry tree filled with ripe fruit. Farther up the path, Steve located an American Redstart. It is possible that there are some late breeders around, but for the most part, the nesting season for NYC birds has ended. A grass buffer between the road and the running track was dotted with thousands of flowering red and white clover. 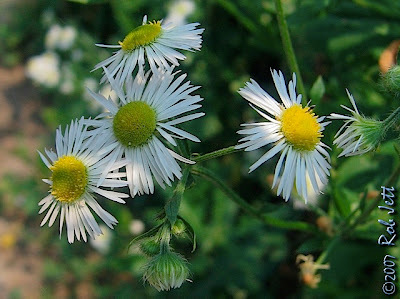 Like a Lilliputian airport, the air space between the earth and flower heads was seething with activity. 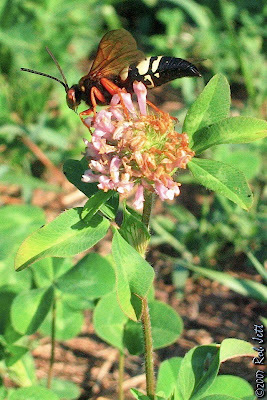 Butterflies, bees, dragonflies, damselflies and hover flies avoided mid-air collisions while competing for nectar-laden blossoms. Also present was one of my favorite insects - the Cicada Killer. I have been observing a colony of these unnervingly large wasps in Prospect Park for several years. Saturday was the first time that I ever saw one feeding on nectar. I never considered the adults diet. I have only seen them hunting cicadas, which they paralyze, carry to their burrows and use as a live host on which their larvae eventually feed. I would not have guessed that an insect with such a sinister survival strategy was a vegetarian. 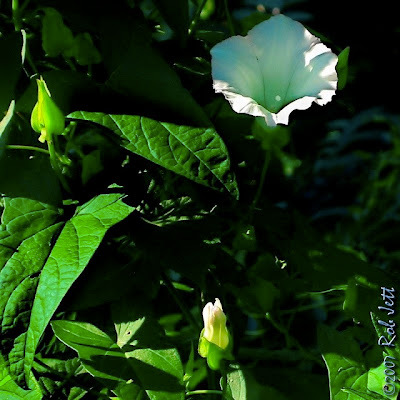 We passed beneath a House Wren singing from a perch within a large, vine-draped tree. He is always in that vicinity, but we have never been able to locate his nest. 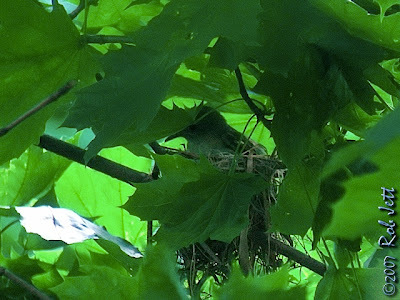 At a spot tangled with multiflora rose, porcelein berry vines and bindweed we noted the presence of White-eye Vireos twice, but like the wren, we never found a nest. Fortunately, on our final day of the breeding survey, Steve spotted a juvenile foraging in the trees above the edge of basin #1. Near the first central maintenance path, we split into two groups. Steve, Janet and I covered the interior of one of the basins while the others surveyed the outside perimeter. Our climb down the steep, granite block lined berm took a little longer than usual. A "safety" line that somebody had attached to a tree was gone. Once inside I noticed that the "bog" has dried out a little since my last visit. There were still plenty of areas carpeted with a mix of emerald green mosses. In addition, the ground below several stretches of yellow birch forest had the appearance and spongy quality of peat bog. As the three of us made our way into the forested sections of this basin, I decided to take a different route through a more dense section. I planned to meet Steve and Janet at the opposite side. Some sections I encountered were impassable and I spent a lot of time climbing over downed saplings or detouring around stands of sapling that were just inches apart. I should have brought my compass. 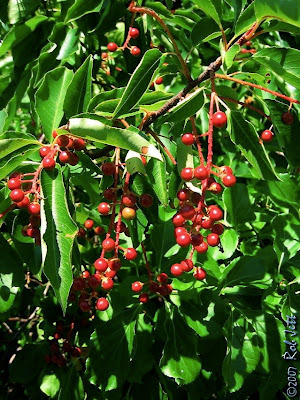 Twenty minutes into the basin, I took a rest at an opening beneath a tangle of chokecherry and other shrubs. There were six chatty young catbirds feeding on berries when they suddenly became curious about me. I made a mewing sound, which brought them closer. Catbirds tend to be tame, but I wondered if these young birds had ever seen a human? When I started hiking back towards Steve and Janet a few of the catbirds trailed along, watching from a safe distance. I caught up with Steve and Janet at a grassy opening near the center of the birch forest. 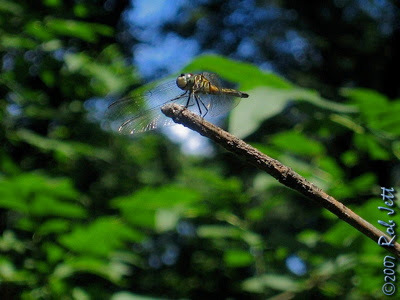 There were dozens of dragonflies flying around or perching on the tips of bare, dead sapling. The majority appeared to be large Carolina Saddlebags. We had not seen many birds to that point, but the singsong whistle of Warbling Vireos seemed to be nearly everywhere. We relocated the Black-capped Chickadee's nest but the cavity in the birch stump was vacant. I heard a distant "dee dee dee" earlier in the morning, but never saw any of these tiny, black and white birds. We exited the basin and walked the asphalt trail to meet the others. From there, we would descend into basin #3. Along the way I heard, then found, a fledgling redstart. She was trailing along behind her father chirping and fluttering her wings for food. There was no way to tell if this was the same young bird Steve and Heidi found a couple of weeks ago. Basin #3 is the smallest of the three impoundments. It has a slight downhill grade towards one corner where it forms a small swamp. Once inside the basin, Janet and I went in the opposite direction from the rest of the group. I was curious if the swamp still existed (as if the mosquitoes hadn't already drained enough of my blood). Most of the water and mud holes have transformed into small grass meadows tucked away between stands of young, narrow trees. There was no sign of the swamp that had previously attracted a diverse mix of songbirds. This lower section of basin #3 is most likely just an area of vernal pools. As we continued walking, I noticed an active nest in a tall, thin locust tree. We had to move to another location to get a clear view of the birds and ended up wading through several yards of chest-deep mugwort. We were in a windbreak and it felt like 90 degrees in the sun. Four chicks in the locust tree stood at separate edges of nest with their mouths agape. It was their only relief from the heat. We circled around the locust tree, as we still could not identify the birds in the nest. Finally, with the sun at my back, I could see three young birds with prominent dark masks across their faces. Moments later an adult Cedar Waxwing arrived at the nest with their lunch. 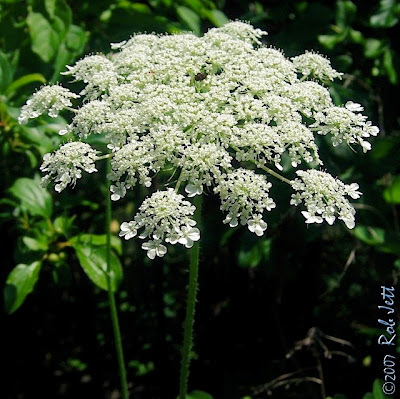 As we were pushing our way back through the maze of mugwort Janet noticed a House Wren. 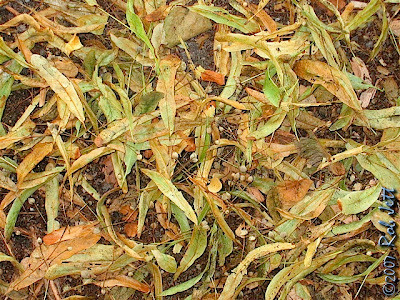 It was a few feet above the ground, near the locust tree. I heard the rattling chitter call of another one in front of us. He had the yellow gape of a young bird. As he flew to our left, another emerged from the mugwort near the locust. Then, another bird answered his rattle. Eventually, a family of House Wrens - 2 adult and 3 fledglings, surrounded us. They did not seem the least bit concerned by our presence and even answered back when I imitated their call. They clung to the sides of trees, flew to dead snags to check us out, played hide-and-seek in the mugwort; we were thoroughly amused by the young wrens for several minutes. Finally, the adults rounded up their brood and they all vanished into the basin's dense understory. I would like to believe that the department of parks will listen to the surrounding communities desire to keep the reservoir as a nature preserve. 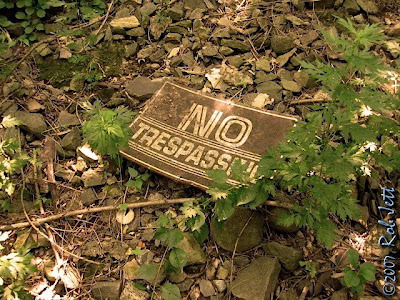 Perhaps the administrators for the reservoir site need a reminder of the mayor's edict for better education, more green spaces and a greater respect for the environment. That mission alone should sway the parks commissioner to use the tools of learning at Ridgewood Reservoir, not chainsaws and bulldozers. On Wednesday I was checking the air in my bicycle's rear tire before riding across Prospect Park. Peter and I were meeting at his office on the opposite side of the park to take care of some computer related business. I was nearly out the door when my computer chimed. A new e-mail came in. I left my bike by my door and came back in for a quick look, just in case it was Peter with a last minute change of plans. It was a note from Peter, but just a forwarded message. 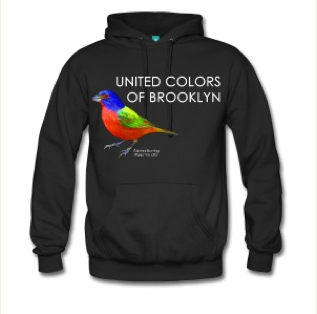 He had received a request for information sent to the Brooklyn Bird Club's website from a woman in my neighborhood. She thought that a pair of owls had taken up residence in a tree next to her home and wondered if it would be possible to help her identify them. I live only a short distance from her street, so I replied that I would be happy to check out the mystery birds when it was convenient for her. It's a quick ride from my apartment to Peter's office in the Wollman Rink, especially since the route is a gentle downgrade. As I rode through the park, I tried hard to ignore the urge to look for the fledgling Red-tailed Hawks. 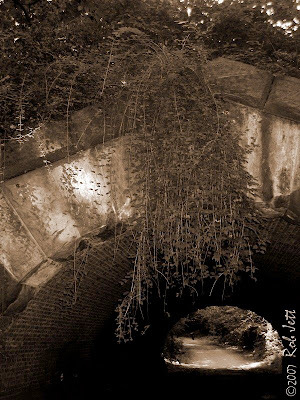 I rode through the Ravine, paralleled a section of the stream and under Center Drive at the Nethermead Arches. I intentionally avoided going too near the Midwood, where I'd be likely to hear the young hawk's hoarse cries. It felt like I was riding with blinders on. Copying the file from Peter's computer only took a couple of minutes. We talked briefly, then I headed off to check on the possible owls in the woman's backyard. I cut across the rink parking lot and merged with the cars, bikes and runners heading north on Park Drive East. Center Drive intersects with that section of road at the south end of the Midwood. Instinctively, as if I were out birding, I made a left onto Center Drive. The towering trees of the Midwood were on my right, probably hiding a hawk from view, but I kept my focus on the road and getting home. I've been known to get sidetracked easily, in fact, much of what I write about here is the result of my shifting focus. So it should come as no surprise that, as I approached the Nethermead Arches, despite the promise I made to myself, I stopped my bike and dismounted. There was a pathetic wailing "weeEE weeEE weeEE weeEE" coming from a treetop next to the Ravine. Alice and Ralph had been slowly weaning their two very large offspring from free handouts. It happens every year at about this time. 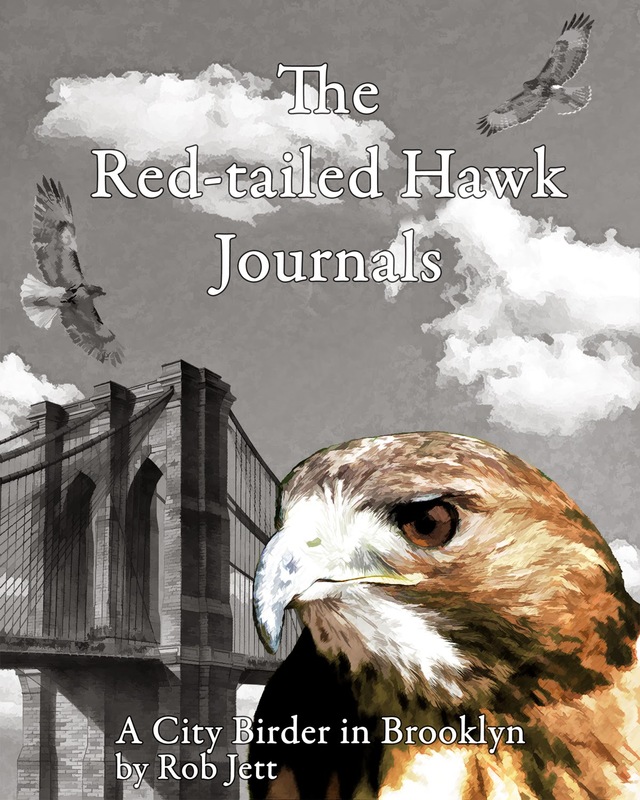 If it were possible to hear, there was probably a simultaneous chorus of unhappy, whining juvenile Red-tailed Hawks across the city's five boroughs. This particular youngster flew out over Center Drive, still calling, and headed toward the Quaker Cemetery. I followed on my bike. As I approached the cemetery I heard the second fledgling, then spotted him near the top of an oak tree on the Nethermead. I stayed for a short time hoping to catch a glimpse of one of the young hawks attempting to hunt. An alarm that I had set on my cellphone startled me with a screeching reminder to get moving. "Thanks for getting back to me. We have had quite a bit of bird drama since I last wrote. 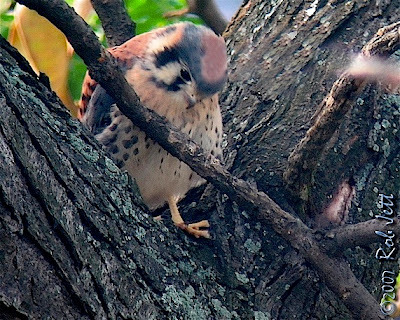 Two fledgeling kestrels made their way to my front yard [...]. I think their nest is on the ledge of my house. One came on Sunday the other on Monday afternoon. The first was fat and had a hurt wing the second a bit smaller but just as cute. I called the raptor trust in NJ, who in turn gave me the number of Eileen Jones, a certified raptor rescue person. She came and got both birds. Meanwhile, I had contacted you about the two birds I often see in the back. They seem too big to be kestrels but I'm certainly not an expert. If you want to help ID these bird please come by. Just ring the bell if it is ever convenient for you. You are always welcome. Oh yes I will try to get a picture of the couple in the back. I have pictures of the babies." I couldn't believe it, I'd finally get to see the nest and possibly offspring for the kestrels that always pass over my roof! I gathered my gear together and rushed out of my apartment. Linda opened her door and I introduced myself. She was expected Peter, but I explained that I was a friend and that he had forwarded me her email. I asked her about the kestrels that she rescued and she point out a nest on a ledge just below her roof. 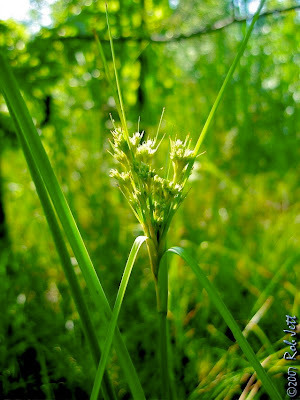 It was made out of grass and other plant material. The nest was slightly wider than the ledge, but held in place by pigeon spikes. 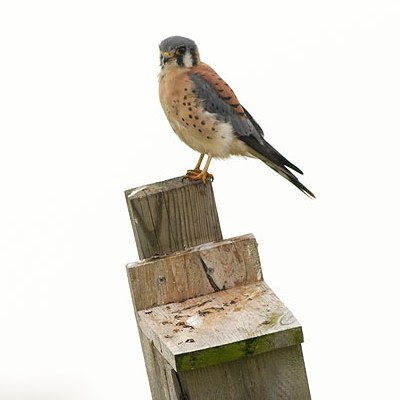 I thought that kestrels only nested in cavities, but told Linda that I'd research it when I got home. 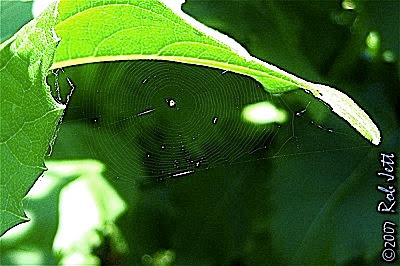 She showed me to her backyard then pointed up towards the crown of a sprawling locust tree. Without looking through my bins I knew that they were fledgling kestrels. The pair still had the cute, rounded face and fluffy appearance of young birds, but, unlike the two Linda rescued, seemed old enough that they could fly. In fact, not long after I began scanning the branches for any other fledglings, one took off. He flew over the roof, behind us and to our right. 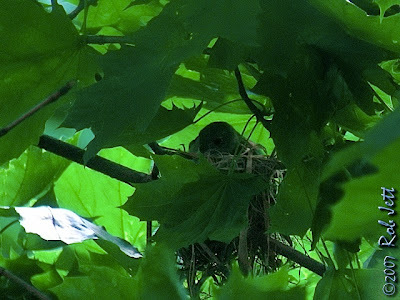 Mom arrived at the tree with, what looked like, a House Sparrow for the remaining fledgling. It was difficult to see, so Linda suggested we go up one level. From there we could see a little better and spotted one of the adults zipping passed. We stayed there watching for a while, but still didn't have very clear views. 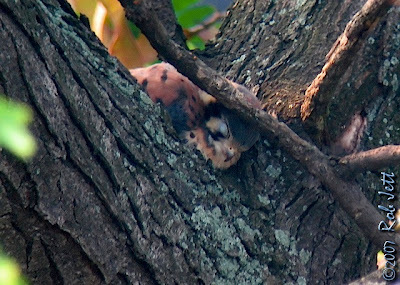 At one point I could no longer see the young raptor as he had hopped towards the tree's trunk. Linda said that we could go up to the roof to get a better perspective. Access to the roof was via a narrow, steel ladder from inside the house. When I climbed out onto the roof and stood up, one of the first things I noticed was the satellite dish atop St. Savior's High School. It made sense. I understood why the adult male liked that perch as he could keep an eye on his brood from a distance. He probably had several similar perches around the neighborhood. Back in the locust tree I relocated the young falcon. He was sleeping in the crotch of two branches. It would make a great photo, I thought, but there was a narrow branch cutting across the frame right at his head. I tried moving to different spots, but it was always obstructing part of the image. It wasn't until I got home and saw the photos on my computer that I realized the branch was butted right up against his head. It actually prevented him from sliding out of the tree as he slept. Smart bird. We stayed on the roof until he woke from his siesta. After a few minutes of preening and stretching he was ready for some flight practice. He took off flying right towards us, banked sharply to the right, made a wide arc over the connected backyards then came in for a landing on the opposite side of the tree from his starting point. The flight lasted for all of about 10 seconds. I guess he was still feeling a little stuffed from eating the sparrow. I know that there are people who read this blog who live far from New York City. It must seem odd to those folks how relatively often I write about some rare, exotic species showing up within or close to the city's borders. I'm a native New Yorker and have no problem admitting that this place is a little different, but exotic isn't a word I'd associate with The Big Apple. In some instances the rare sightings are attributed to our unique topography, the shape and orientation of the New York/New Jersey Bight, ocean currents, weather patterns or the numerous job opportunities. And then there are times when nobody even bothers trying to figure it out. Monday morning Sean picked me up on his way to Calvert Vaux Park near Coney Island. 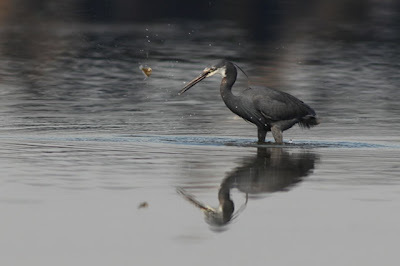 On Sunday Alex Wilson had discovered a Western Reef Heron feeding in Coney Island Creek at low tide. The presence of a birder at the creek is almost as unusual as that species of wading bird. Anyway, Doug called at about 7am to let me know that it was still present. 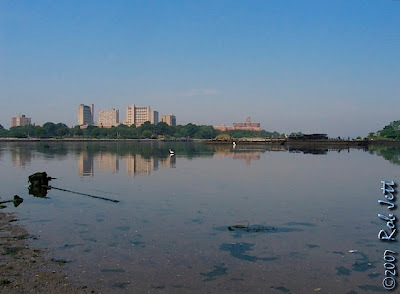 I've posted a few times about Calvert Vaux Park only it was under its maiden name: Dreier-Offerman Park. Located just south of the Verazanno Bridge and north of Coney Island, the park is a manmade (or at least man-expanded) peninsula. 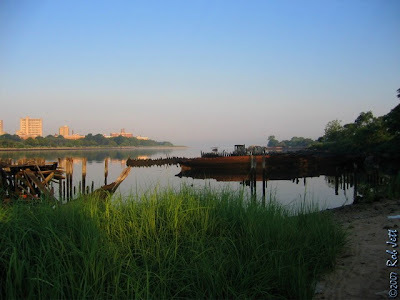 It looks out onto Gravesend Bay and Coney Island Creek creates a tidal mudflat near the park's south end. People who had arrived at the park early were in the park looking south at the heron. Doug called us and recommended that we park at "Toys-R-Us" and approach the creek from the opposite side, with the sun at or back. It was great advice as we had well lit, close views of the heron. 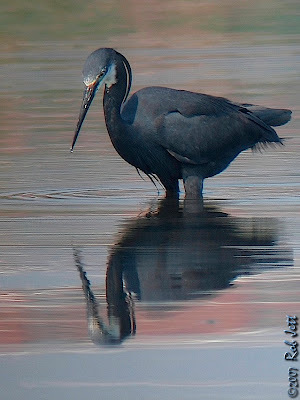 The heron is primarily a stunning blue-gray coloration. 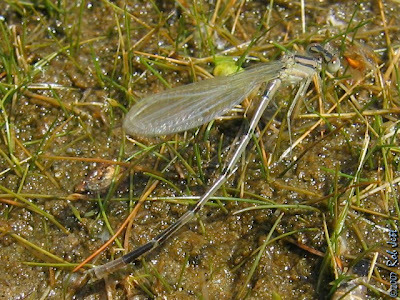 His throat is white and the top of his head has a single, long plume reminiscent of "Alfalfa" of "The Little Rascals". Approximately the same size as a Snowy Egret, he similarly has bright orange feet contrasting with dark legs. It hadn't occured to me that I was observing the heron while squishing around in sandles in mud that was, in all likelihood, chockful of toxins. I was just so fascinated by one of his foraging techniques. 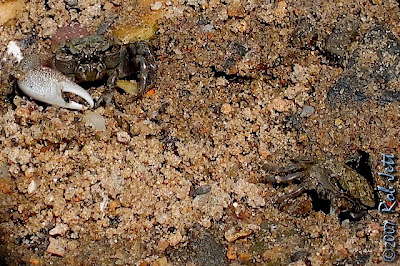 While standing in shallow water, he would rapidly vibrate one of his legs, presumably by shuffling his foot in the mud. The motion would either attract prey or flush them up off of the bottom. Either way, he'd spot something tasty and snap it up with his dagger-like bill. In my excitement to run out and see the bird I overlooked one small item; I didn't know anything about it and it wasn't in any of my North American guides. Sean knew just slightly more and most of the people I asked at the creek were also uninformed. So why all the hubbub? The bird had been reported in New Jersey and I guess word filter down that it was "special". The Western Reef Heron's range includes west Africa, the Red Sea, the Persian Gulf and India. The bird near Coney Island is only the 4th record in the United States. This bird is a mystery to me. We know that he flew here, but why? I have also learned that biologists aren't even certain of his identity. I'll spare you the confusing details, but lets just say they can't decide who is a cousin and who is a sibling. A Snowy Egret seemed to have some problems with the foreign visitor and frequently displayed aggressive behavior towards him. Maybe this species of wading bird is just following in the footsteps, or rather, wingbeats of the Cattle Egret. 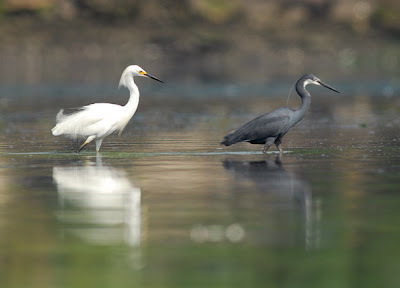 Click to view video of Western Reef Heron "shuffling"
By this point in July, most of the breeding bird species in NYC have completed their breeding cycle. There are, however, some late breeders and a few that have begun a second or third brood. I don't know how Acadian Flycatchers fit into that schedule because they haven't nested in New York City since 1915. I was curious to learn how the pair in Prospect Park were faring. I presume that nesting in a busy urban park could be very stressful (unless you are a House Sparrow or pigeon). 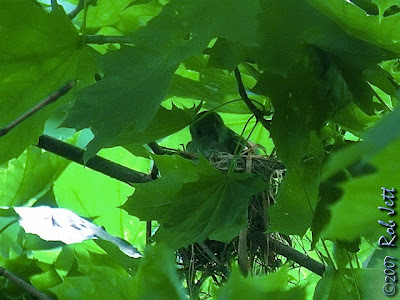 Why these Acadian Flycatchers decided to forego a lush, quiet patch of forest to raise a family for a tiny, postage stamp of green in the center of Brooklyn is a mystery. I wanted to keep tabs on them, but would do so from a distance and for brief durations. It was late afternoon when I walked into Prospect Park on Saturday. Despite a cooling southwest breeze, high humidity and temperatures hovering near 85 degrees made the normally easy stroll feel like a forced march. The last time I looked in on the flycatchers I found a perfect viewing spot for setting up my scope. Before going home that day I took a piece of stone and scratched three "X"s into the walkway beneath my tripod's feet. 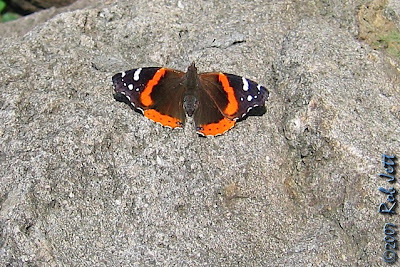 When I returned to the area I spotted a Red Admiral butterfly resting in the sun on a boulder. Nearby were the now faded three "X"s. I thanked the butterfly for pointing me in the right direction, then set-up my scope. The acadian was still sitting on the nest, but acting fidgety. Every minute or so she would stand up, look into the nest and stick her bill down into it. A few times she left, hunting for something to eat in an area no more than 50 feet from the nest. She was never gone for more than 5 minutes. In a rapid sequence of photographs I shot you can get an idea of her curious behavior. I'd like to think that she was fussing over her chicks, but I never observed anything moving in the nest. Adult Acadian Flycatchers are pretty small so their hatchlings are probably fairly well developed by the time their heads stick up above the edge of the nest. I stayed for about 30 minutes during which time I heard the male's explosive "PEET-suh" whistle several times coming from different directions. He eventually showed up several yards north of the nest, hawking for insects from a perch in a low shrub. Much farther to the south and from the tops of the tree, were the alarm calls of a group of robins followed by the desperate "weEE weEE weEE weEE" cries of a young Red-tailed Hawk. On my way home I stopped near the Picnic House to look at some flowers. Near the southwest corner of the building a large, flowering mass of Oakleaf Hydrangea shrubs seems to have doubled in size since last year. I also noticed a new planting in a small island of dirt in the concrete pathways near the building's entrance. At first, I thought they were chestnut or horsechestnut saplings. 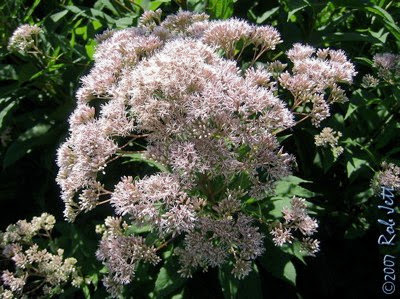 The plants had similar palmated leaves and flowers growing in long, upright clusters. Neither should be flowering at this time of year. Also, the small individual flowers had extremely long stamens. They reminded me of hydras or a creature from Greek mythology. 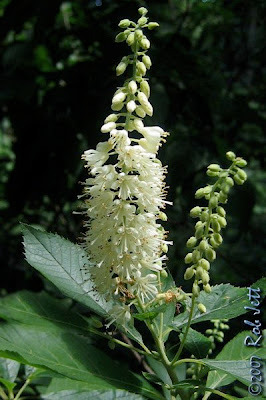 I eventually found out that they weren't trees, but shrubs, and they were a native plant called "Bottlebrush Buckeye". As I continued towards 5th Street a slender tree caught my attention. 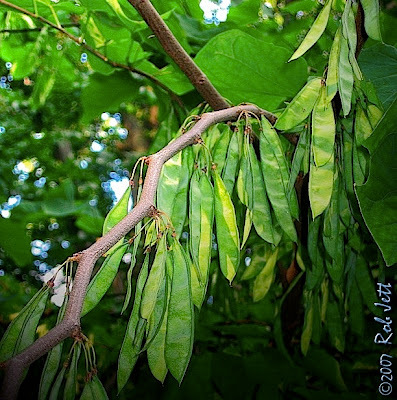 Every branch and twig was draped with, what looked like, green snap peas. I scanned the adjacent trees because I knew that there was a Redbud along that stretch. 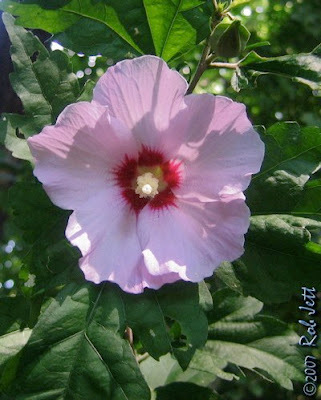 The tree turned out to BE the Redbud. Every Spring I look forward to Redbuds beginning to flower. Then the songbirds start to arrive and I forget all about the flashy tree enveloped in fushia blossoms. Saturday was the first time that I noticed its seed pods looked like peas...or even that they grew fruits. What else have I been missing?